Five years after the international financial crisis hit Spain, and less than two years after the Spanish economy started experiencing a weak recovery, the country has fallen back into recession. Negative economic growth rates of over 0.4% in the first half of 2012 have been accompanied by a worsening labor market situation, with almost 25% of the active population registered in the unemployment system. While the European authorities and the Spanish government continue focusing their attention and efforts on fiscal consolidation, and thus on measures that can potentially affect growth negatively in the short and medium term, the immediate future of Spain does not look promising. Investors, companies, entrepreneurs, workers… all alike wonder: where is economic growth going to come from? In view of these circumstances, and as different experts and leaders have been warning, it became clear that a more ambitious and better designed roadmap for growth and fiscal consolidation, based on a true growth strategy with clear short, medium and long-term objectives and measures, is necessary at both the EU and national levels. A new Ideas project will explore how such a strategy would look like in the specific context of Spain over the next months. Based on the diagnosis of the current obstacles and opportunities for growth in Spain (see figure 1), the strategy Ideas for Growth, Horizon 2020 will set specific economic and employment growth targets and measures to obtain them around certain strategic intermediate goals: going global, resetting the workforce, an entrepreneur and business revolution, a pact for welfare, renewed energies, open markets, and a dynamic state. As depicted in figure 1 below, an exit to the crisis based on internal demand is almost impossible at the current juncture in Spain. Both families and businesses are working to reduce their accumulated debts while the public and financial sectors are immersed in a long process of de-leveraging. Additionally, given that most of the burden imposed by the fiscal adjustment is affecting the citizens, internal consumption can be expected to further decline in the near future. In the short run, therefore, going global is the only means for economic growth in Spain. In fact the reliance of the Spanish economy on exports has been constantly growing since 2010. 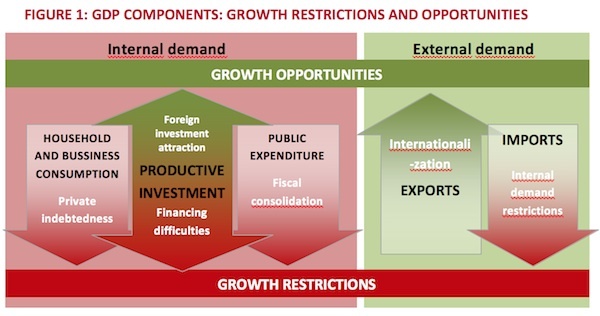 A soon-to-be published Ideas document for debate specifically dealing with this pillar of the growth strategy identifies several key objectives to enhance the international orientation and competitiveness of the Spanish economy. The document estimates that a new Commercial and Foreign Investment Policy Agenda for Spain for the year 2020 should focus, among others, on measures that help Spanish companies overcome size-related obstacles for innovation and internationalization, and on interventions that help attract and consolidate new foreign investments in the country. In the longer run, a reformist pact in Spain involving all political, economic and social actors, will be necessary in order to attain a common recapitalization agenda. In the last months we have witnessed a process of bank recapitalization. The Spanish economy must put into place a similar process in five other fields that are key to a sustainable growth pathway: (1) human capital; (2) labor capital; (3) scientific, technological and innovation capital; (4) environmental capital; and (5) social capital. 1.Resetting the workforce, through new and strengthened active labor market policies. 2.A thorough public administration and welfare state reform that transforms them in a true source and trigger for economic growth, based on equality of opportunity. 3.A fiscal system reform that improves justice, progressiveness, effectiveness, efficiency and sufficiency. 4.A business sector revolution, through the promotion of entrepreneurship and entrepreneurial culture, and a renovated industrial policy. 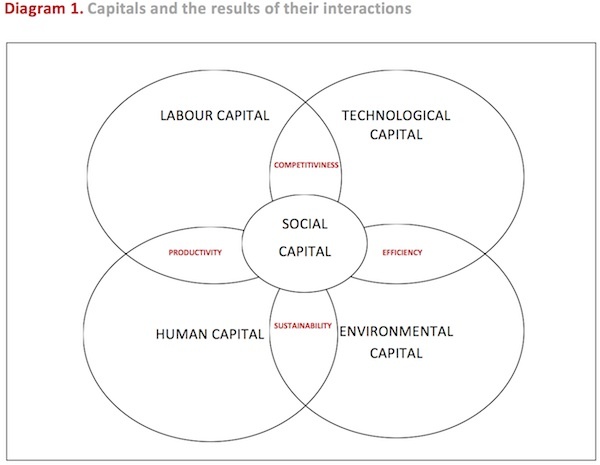 The positive synergies among the different forms of capital (see diagram 1) would in turn give way to a sounder and more stable economic and employment growth. In this way, labor and human capital would ensure productivity improvements, labor and technological capital would make the country more competitive, technological and environmental capital would grant a more efficient use of resources and human and environmental capital together would allow bringing sustainability into the center of the productive and growth model. Improved social capital would be both a central outcome and key input for all these interactions. One could have the impression these days that there are no responses to effectively escape the situation that Europe and Spain are going through today. Financial markets impose their authority while overwhelmed governments react by further tightening their budgets, in a stated effort to increase confidence. However, it is increasingly clear that only the perspective of future growth would generate the confidence that the markets and citizens require and that the economy needs to step out of the negative spiral that is drowning us all together. The right responses are there. It is not so much about re-inventing the wheel… but about effectively using it to move forward. Would you like to discuss this topic, please check our group.